SAN LORENZO MARKET AND THE "MERCATO CENTRALE "
SAN LORENZO MARKET: From Piazza S. Lorenzo to Via dell'Ariento, all around the Basilica of San Lorenzo (in the very historical center of the city) you can find what may be the most important market of the city. Just walk around searching for clothing, articles in leather, souvenirs, etc. It is Closed on Sundays and Mondays. MERCATO CENTRALE: Stalls inside the San Lorenzo central market, in Via dell'Ariento you'll find the best food market of the city. Walk in and discover. It opens every morning from 7am to 2pm, Saturday from 7am to 5pm, closed on Sunday and public holidays. 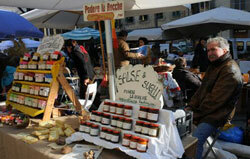 Located in Piazza Ghiberti and Piazza Sant'Ambrogio, the market is both indoor and outdoor. 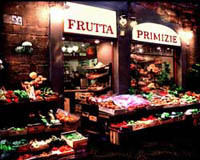 Just walk around to discover fresh fruits and vegetables, clothes, flowers, shoes and houseware stands. Then, move inside to discover a large selection of fresh meat and fish, pasta, general groceries and a wide array of farm direct cheeses. Hungry? Take a seat in their connected restaurant (innexpensive and delicious). The market it's open every weekday (except Sunday) from 7 to 14. 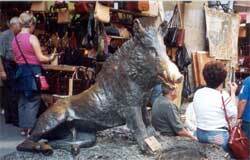 The famous FLEA MARKET of Florence is located in Piazza dei Ciompi and opens (every day from 9 to 19.30). If you're lucky enough to go there on the last Sunday of every month, the stalls extend into the surrounding streets. Here you can find furniture and objects from the past, prints, coins and jewellery. You can also find affordable treasures amidst the bric-a-brac and dusty books. It's worth a trip if only to get insights on Italy's past through the artifacts displayed in these cluttered stalls. 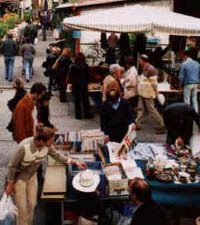 On the last Sunday of each month about 100 more stands, distributed also in the surrounding streets, enrich the market. The "Fierucola" is a market selling biological products and promoting the use of organic and biodynamic farming on a small scale. Here, visitors will find many wine and food farming products without chemical substances and also several handmade products. 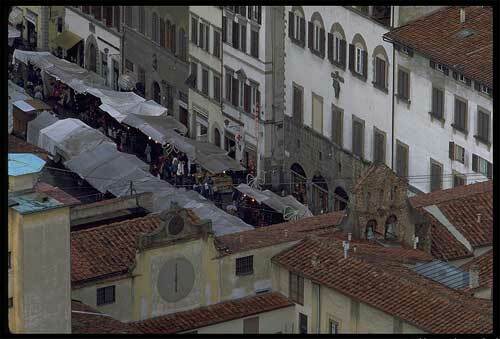 It takes place on 3rd Sunday of every month (except August) in Piazza Santo Spirito (in the Oltrarno). Advent is a really magical period for visitors arriving in Florence. 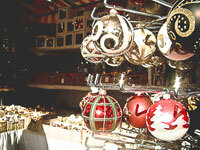 The Christmas' markets and the craft bright activities, liven up the festives season. This is an opportunity to really enjoy looking around for gift-ideas or just wondering through the stalls during the festivities typical of Florence. Typical Christmas Market where you can find ornaments to decorate your Christmas tree and Crib; also, traditional sweets from the nordic regions are found and the interior decoration is carried out in a very special context. Opening hours: Every day from 10:00 - to 20:00 hrs. Christmas in Florence. Stazione Leopolda - Viale F.lli Rosselli. First week in December. Payment on Entrance. Inside the market; there is the House of Santa Claus - 'Babbo Natale' where the children will be able to meet the mithical Santa and perhaps have a photo taken on his lap. moreover; you will be able to see among other things scenes representing the North Pole, where the most famous father in the world lives. Fierucola di Natale: Christmas - Fair. Piazza S. Spirito.